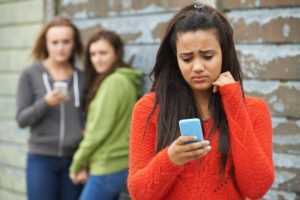 Unfortunately, the cyber element to bullying is a growing concern for parents and schools. There was a time when bullying was confined to face to face interaction. With the growing use of digital communication, the cyber element to bullying is only increasing. What can you do to support your child if they become the victim of online bullying and in general what can you do to help your child to stay safe online? Cyberbullying involves using technology to bully people. It can include texting, instant messaging, and posting content on social media and gaming websites. As always, communication is of paramount importance. Having an open communication style with your children in relation to what they are doing when they are online is the foundation of a healthy relationship with the digital world. It is far more likely that your child will confide in you if they are used to having regular conversations with you about their online life. It can of course happen that your child may unfortunately be experiencing cyberbullying and may not initially tell you about it. It may be brought to your attention by another parent or by your child’s school. While the cyber element of bullying is relatively new, sadly bullying is not. One of the most insidious elements of cyberbullying is the fact that it can be very difficult to avoid or get a break from. Through our work at Zeeko we regularly hear from parents that this is a huge concern for them. The potential relentless nature of cyberbullying is very different from the types of bullying that parents may have experienced during their own childhood and adolescence. Once you become aware that your child is being cyberbullied it is important that you keep a record of the messages and/or conversations that your child has been having. Depending on the nature of them you can report the bullying to your internet service provider. This is also an appropriate time to revisit the safety settings across any digital devices that your child is using. If your child is being bullied via calls and/or text messaging, you can also report this to your mobile phone provider. Remind your child of the importance of the basics of staying safe online which is the STOP, BLOCK, TELL. This is especially important during a time when you and your child are working together to deal with an incident or incidents of cyberbullying. Parents often find great support in discussing an issue like cyberbullying with another parent, sharing experiences and getting practical advice. It is also a good idea to let your child’s teacher and/or the school Principal know about what is happening. Sometimes, cyberbullying can happen with people not known to your child but sometimes it can also involve people who are known to your child. A growing number of schools have an anti-bullying policy which can include a specific section dealing with cyberbullying. Schools are also developing acceptable use policies in regarding the use of technology in schools. Both types of policies can be a useful guide for you and the school in dealing with cyberbullying. What is crucial is that your child knows that all the adults around them are working collaboratively to find a solution and that will ensure that they are protected and safe. Bullying in any form can be frightening and extremely upsetting. Encourage your child to take some time away from digital devices. Learning and knowing that there is an off switch to technology can be a very powerful tool that will stand to them now and in the future.